The holiday season is upon us! I just celebrated Thanksgiving with my family and decorated my home for Christmas. My merry tree is decorated. I’m obsessing over the scent of pine and the taste of egg nog. The shopping frenzy of Black Thursday-Friday is over. While I am loving the twinkly lights and the hopefulness of this season, it can be a difficult time to navigate for me. Gift exchanges are popular now. Years ago, I read Gary Chapman’s “The Five Love Languages” and realized that receiving gifts is important to me. So, how do I express love to others using a physical item? My toddler niece is too young to have a list of desired items yet. So, do I purchase needed items like leggings or something impractical like a Disney Princess something? What to get my mom who has everything she wants or needs? Fortunately, one gift I do not need to think about is my annual gift to myself-the Duran Duran calendar. Every year, around mid-late November, I look forward to DDHQ’s announcement that a calendar will be issued. Yes, folks, there is a 2019 edition available now on the band’s website. As I bought mine, I pondered my annual tradition. Why is this item important to me? I know I value the calendar because I don’t entrust my family to buy it for me. Timeliness is not their forte and I want my calendar in my hands by January first. It’s just a calendar in a world of calendars so what makes the Duran Duran one special? It’s a work of art. I bought my first Duran Duran calendar in 1984. It reflects that Seven and the Ragged Tiger vibe. Just gazing at its cover brings forth memories of random “Sing Blue Silver” lines. Every year, the calendar has distinct visual elements. Some years, the band elects to use concert photographs. Other times, the band members are carefully posed. One of my favorite calendar photos is of John in a light colored suit, walking down a street. It’s a stunning photograph that could hang on a gallery wall. It’s a practical tool. Okay, I’ve just spent two paragraphs lavishing about a CALENDAR! At first, I would never write on my calendar. During an “It’s time to lose some weight, Nat” period, I would record my exercise minutes on the DD calendar. The calendar layouts change each year. Some years are more conducive to recording important events. I’ve struggled with a few layouts because they were so impractical. Yet, even the impracticalness, made that year’s calendar unique. I look forward to the first day of each month to see what the next month will bring. I don’t peek-LOL. It’s amusing when I use the calendar when booking appointments. “Excuse me, Roger, I’m talking to my dentist. Yes, I’m available on 3rd at 5:00 p.m.” I love it when the band uses some European elements and/or words. They are being inclusive to the fan base. Plus, I get to dust off my high school French. It’s become a tradition (for me). There have been a few years when the band didn’t produce an official calendar. In response, I did what fans do- I pouted for a few seconds! Some awesome graphic designers shared fan-created calendars with me. It’s not the same. It’s flimsy when compared to the heft of an official calendar. When purchasing the annual calendar, at times, I buy another DD item. Other times, just a calendar purchase is enough. Just like a child on Christmas morning, I look forward to this special piece of mail from the U.K. The annual Duran Duran calendar is a gift to me, from me. I will keep buying if they keep producing. Deal! 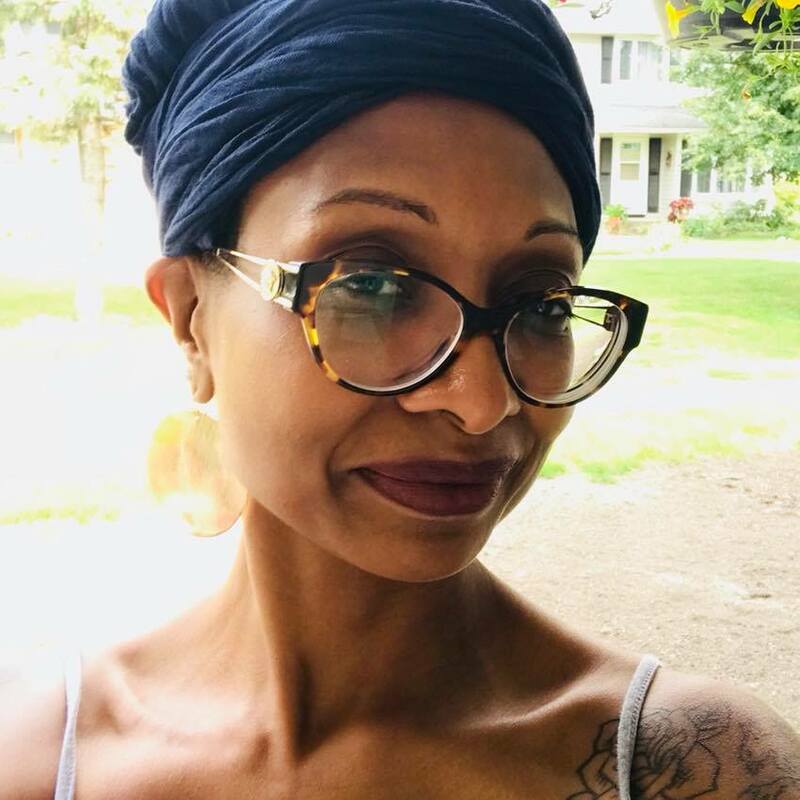 Nathalie is a daughter, sister, Auntie, educator, reader, dreamer, Christian, Midwestern, Sci-Fi & Superhero Nerdette whose favorite band is Duran Duran. She owns multiple copies of most DD albums. She collects band t-shirts and proudly wears them in her everyday life. When you’re in a relationship, you celebrate moments. I’ve been listening to Duran Duran music since the needle dropped on the Seven & the Ragged Tiger album on my sister’s plastic Fisher-Price record player. So, yes, I’m in an active relationship with Duran Duran’s music. It’s SLB’s 60th birthday as I type this. Earlier this week, I was delighted to read an Instagram remembrance post about the band’s show at the Sears Center on October 26, 2006. I was also chagrined because I didn’t remember the exact date. Whoops! I should try to remember this date because it was my first …front row experience! When Astronaut was released, I was teaching full-time and my funds were minimal. I went to the shows that I could afford. I was glad to be at the shows but felt unsatisfied with my view. I observed very happy fans sauntering to the first two rows. Afterwards, I promised myself that if the opportunity arose, I would try for a “VIP” seat. I was honoring that preteen who wore headphones while delving into the depths of the DD catalog and her hard work since then. On the presale date, I remember sitting at my computer with sweaty palms while on the DDM site. Anxious thoughts were pervasive: “How does this work?”, “Will I get a get a good seat?”, “Am I a fool for trying this and going alone to a show?” Hours-no minutes- later, I scored a VIP ticket. Yaaasssss!!! I posted on the fan board that I was going alone and looking for meet up with other people. Two big hearted fans from Seattle and San Antonio said they would hang with me. I still appreciate their extended kindness and when fans embrace each other at shows. I stayed at the hotel and got my ticket from the DDM staff. I opened the envelope and thought, “Hmm, this might be good.” A fan asked me where I would be sitting and when I told her, she walked away without speaking to me. Yikes! It was not a good way to start a show. Luckily, I met the two aforementioned fans and enjoyed spending time with others. We got to hear the band’s sound check and they rehearsed “The House of the Rising Sun” for the Voodoo festival which was a few days afterwards in New Orleans. I was thrilled for this unexpected and not repeated treat. I watched a fan get whisked away to meet the band before the show. When the fan returned, she was dazed but graciously accepted my congratulations. I remembered walking toward my seat and asking an usher for assistance. She smiled and told me where to go. When I saw my seat and its proximity to the stage, my…heart…swelled. It was a palm to the chest moment. I don’t remember many specific moments about the show. They did play “Hold Back the Rain” which I miss in the set list now. I think we sang “Happy Birthday” to Simon. What matters is that I dared and enjoyed the experience. I’ve purchased several “VIP” tickets since this show. “To VIP or not to VIP” will always be a question I will ask myself of the concerts I attend. I’ve learned that each show is unique. I’ve learned to have quasi-realistic expectations. No, John has never mouthed, “Hey, Boo” towards me from the stage. I’ve learned to look for the minute interactions between the bandmates and to appreciate a different perspective from each seat location. Most importantly, I’ve learned to be more GRATEFUL that I can attend a concert wherever my seat may be located. Every once in a while, we are thrilled to have someone write in and ask if we still accept guest blogs. Rest assured, WE DO. We love handing over the proverbial microphone to somebody new! If you feel particularly passionate about a specific Duran Duran topic, or you want to share your own point of view – don’t hesitate to write an article and send it to our gmail, we’d love to hear from you! I’m a lover of live music. I try to get out and see someone perform as often as possible, even if it’s just a local band in a bar. Having just come off a seven-day stretch where I found myself at three excellent concert tours, plus the touring production of Hamilton, I’m going through some music withdrawal. Usually, I have at least one in the queue, so this is a bit of an odd feeling. Curiosity getting the better of me, I started poking around. Taking a second look at what bands are headed to the Boston area in the coming months. Acts that may slipped under my radar. That’s when I noticed Nine Inch Nails are coming in soon. They are booked for two shows at the Wang Center. The Jesus and Mary Chain are their opener. I’ve never seen either of them live, but was a casual fan of NIN in the 90’s. I still have Pretty Hate Machine and The Downward Spiral on CD around here someplace. Being one to do a little research, I popped over to Setlist.fm to see if some of my favorites were in their rotation. You never know which bands suddenly decide to stop playing their earlier work. I was near stunned by what I found. Before I dive into what surprised me, let’s back up a bit. I’ll preface by saying I know this complaint comes up often among the Duran Duran fan base. The band we all love tends to play the same songs night after night once a tour is underway. Maybe changing one or two songs out, and modifying the order slightly. Some fans complain that they skew too much toward their newer music. Others will say they are bored with the chart toppers, and lack of deep tracks. People will go to three or more shows, then be hugely jealous of others who went to a show where a track like Hold Back the Rain made the cut. I’ve defended this in the past saying Duran Duran are playing to the 98% of people that don’t go to multiple shows during a tour. Adding that their songs require a bit of extra prep and practice. That they need to be well-rehearsed to play along with a sequencer track of atmospheric sounds. That they are artists first and foremost, and are always going to want to present their latest works to the public. That they need to cater to the casual fans as much as their ‘regular’ fans since they will always outnumber them at a show. Wait, which band am I talking about? It could certainly be either! What was I stunned about with Nine Inch Nails? As of this writing, in 33 shows performed so far in 2018 they have played 63 different songs. 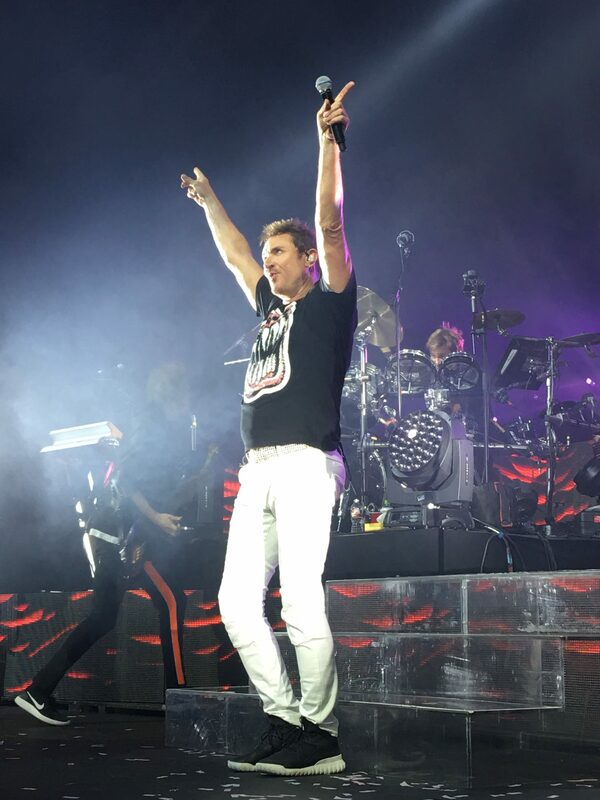 (1) Rewind to the last years that Duran Duran had a considerable number of shows on tour. In 2016 they had 60 shows playing only 22 unique tracks. (2) In 2017 they played 27 shows with exactly 27 songs. (3) Keep in mind, both bands only play in the neighborhood of 20 songs a night. Attached is a setlist of four recent Nine Inch Nails shows. Two cities, two shows each, on back to back nights. One pair of performances in DC, and another the month earlier at Red Rocks Amphitheater. They seem to have no issues with mixing things up on back to back nights. They leave out huge songs from their repertoire (Closer, Perfect Drug, etc.) one night, and go ahead and play them the next. 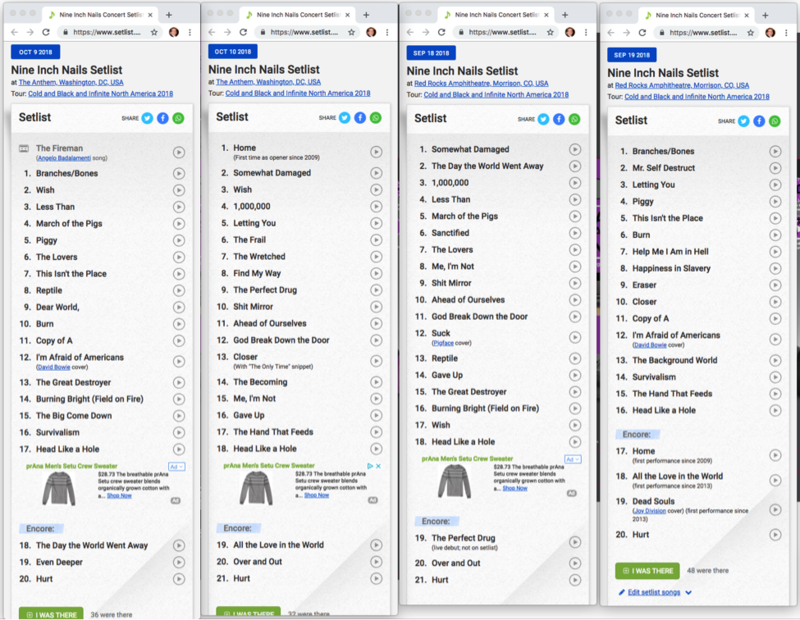 The only thing constant among these four shows is finishing the main set with Head Like a Hole and finishing the encore with ‘Hurt’. Playing multiple nights back to back at a particular venue is something Duran Duran do from time to time. However, it’s been six years since John Taylor said “More performances in fewer places”,(4) but the band hasn’t really acted on that idea in a meaningful way. The boys from Birmingham could learn something here as they are (hopefully) planning for a tour to coincide with ‘DD40′. They don’t always need to play wall-to-wall hits to appease the masses. It really is okay to leave fans, die-hard or casual, wanting more. Could they reach the point of making it clear ahead of time what the shows will be like? Maybe announce a series of two-night stands playing the complete first album plus another 10 or 12 songs one night, then the next night the Rio album with an even slightly different assortment of songs? I’d be at both, you can count on that. Maybe the band will even entice a few of those casual fans to snag a ticket for a second night before they pack up the gear and leave town. 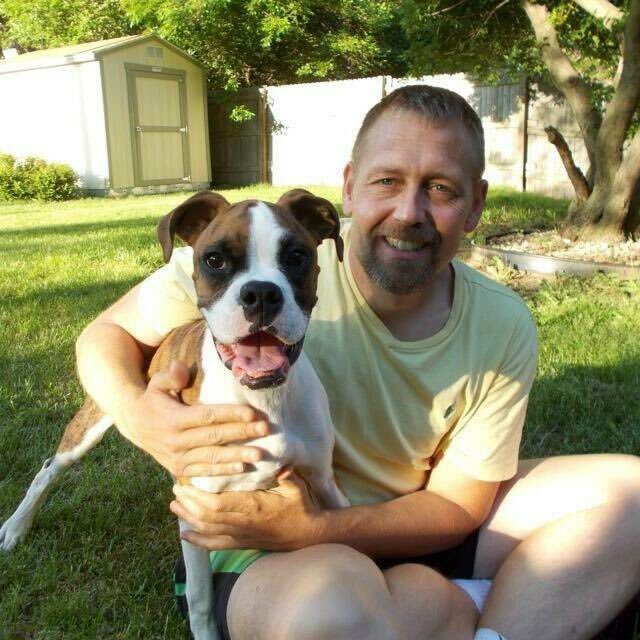 Mark is a Graphic Artist and a long-time fan of Duran Duran. His first concert was on their 1984 Sing Blue Silver tour, and he has seen the band live on nearly every New England appearance since then. Mark currently lives in New Hampshire, and isn’t afraid to travel to see a show. For me, the Common People Festival Oxford show is the closest to home that Duran have performed. It’s only an hour by car so how could I not go? Well, as a single Mum to three teenage girls, two of whom are in major exam mode at the moment the timing wasn’t great. However, I’d suggested to my close friend that having seen them in December at Bournemouth maybe we should consider another outing and the tickets were well within our price range. My two eldest then decided that they would abandon exam mode that day as it was Comic Con in London. Could Mum take them and two others to the train station at 8am? OK, if I was going to do Common People as well then it was looking like a VERY long day. Also there was my 15 year old—the youngest—to consider. Anyway I decided that maybe on this occasion I wouldn’t abandon her in pursuit of my own enjoyment, and I’d just wait for the comments on FB and Twitter. There then appeared a competition on DD.com to win a pair of tickets to either Oxford or Southampton, you chose which venue. All that was needed was an email to say yes please and there would be a lucky dip. As I NEVER win anything what was there to lose? Email sent and I got on with being a busy working Mum who is due to start a one-year degree course in September! Then 2 weeks ago I checked my emails and there sitting in my inbox was a “congratulations you’ve won” message. At this point I was in disbelief, I rang my friend Tania and could barely speak down the ‘phone. She was due to be working in PICU on that same day and would need to swap her shift. However, this wasn’t possible and as things turned out she was actually ill on the day and so wouldn’t have been able to come anyway. I suggested to my youngest that maybe we could go together and enjoy the festival. She was not keen on going to see DD. However, Jamie Lawson also playing – that was enough to tempt her. So on Saturday morning with blue skies over head (for once the British weather was kind) we set off. At this point can I say thank you to Common People and DD.com who were very efficient in sorting out emails for the tickets, and also for clear instructions on the Common People website about travel arrangements, etc. We drove as far as the park and ride, easy bus ride to centre of the city and found the shuttle bus back out to the festival. On arrival at the site it was laid out well at the bottom of a slope with the main stage clearly visible. We had a wander around the site, and then made our way to the front of the area by the stage. There were other Duranies already there set up by the barrier but we were happy enough to be just behind them and on John’s side of the stage. Six hours to go until they were on. The other acts were enjoyed, and for Jamie Lawson I was abandoned by teenager as she went right to the front middle. Each act played for about 45 mins and then there was a DJ for about 30 mins whilst sets were changed. From where we were you could see the confetti cannons primed and ready for later. Soul II Soul are a band that I never really got into in the late 80’s / 90’s but they gave a really good performance, good enough that teenager made a note to check them out once home. Finally at 20:30 the last act (Katy B) finished so time for stage to be set. It was at this point that we realised we were in for the full light show as the black curtains at the back of the stage that had been there all day were removed to show the video screen, the risers with the drums and keyboards were brought out and the video screens built around them as we watched. By 21:15 the atmosphere had built. We were now 2nd row JTs side of the stage. The set list was almost identical to that which we had in Bournemouth in December with the exceptions of no Danceophobia, and the addition of the David Bowie tribute. Simon sounded a bit croaky at times but I couldn’t work out if that was just because of the coolness of the night air. The interactions with the crowd were there throughout the show which lasted a full 90 mins. The new backing singer Erin was obviously nervous but it was great to see the support and interactions from the rest of the band. There were some brilliant JoSi moments as well as Dom and John and Dom and Simon. 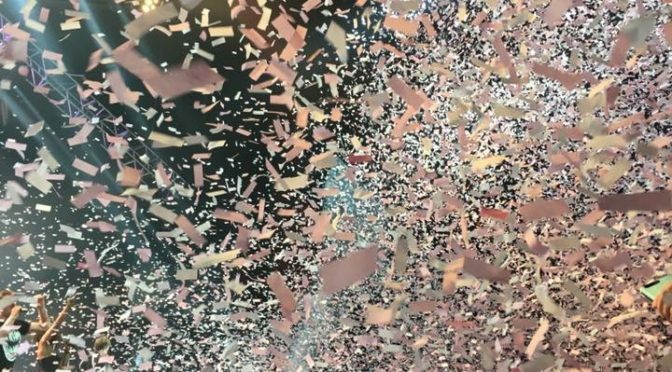 I had seen the effect of the paper confetti from the cannons at the show in Bournemouth but then we were front row of balcony so saw the overall effect, this time we were right in the middle of it and the effect of being outside and “down wind” so to speak meant it swirled and seemed to last for longer. 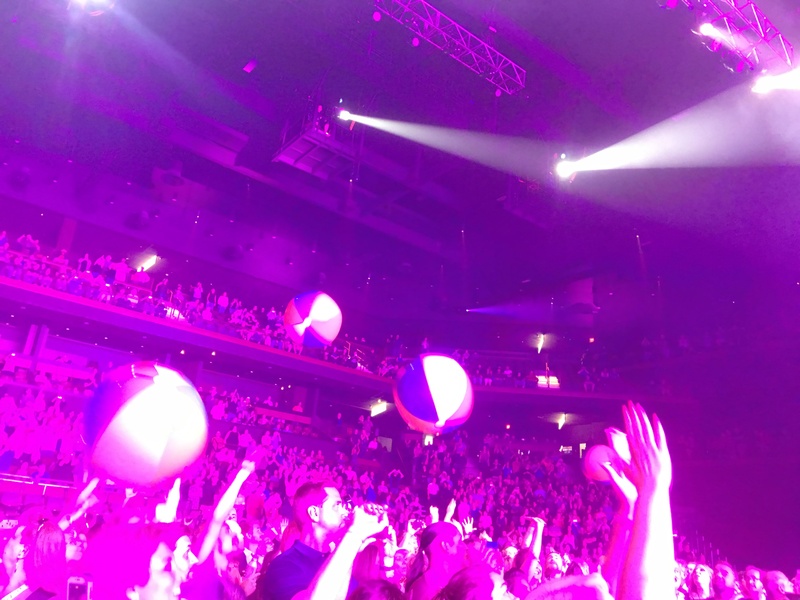 During Rio (last song of the night) large beach balls were thrown into the crowd who then seemed to think that there should be a competition to get them back on stage and get the band involved, to the point where Simon commented that the idea was NOT to aim at the band and to pass them around! And so a fantastic evening drew to a close, the weather had added to the enjoyment and having waited 35 years to see them live I have now managed two shows in six months and am keen to continue the experience! It was brilliant to see teenage daughter singing along to classics and the new songs and even she was buzzing and couldn’t stop talking all the way back home about the show. I recently tweeted some thoughts on Twitter concerning my thoughts on the current state of Duran Duran. I changed my mind several times, reached out to friends, changed my mind again. I re-edited my writing (several times), and decided I still needed to communicate some of my thoughts, for my own sanity. The following is my “edited version”, or “PG version” which is far less speculative, but still contains quite a few opinions. On Twitter, I recently “called my shot”, and proclaimed that I believe that Paper Gods is the last proper album and tour cycle for the band. The reason for my tweets were not to cause drama, gain followers, or throw shade at the band or management. I care very passionately for this band and its music. It has been a part of my life on a daily basis since 1984, and always will be. Above all, and most importantly, I know that we will always have the music of Duran Duran. In addition to following every note, lyric, and news item, I closely follow the music industry in great detail. I have made many observations that have been building in my head for over a year now, and I feel the need to share those observations in great detail. These observations are heavily based on my opinion. I have no inside information directly from the band. I honestly don’t want the band the stop recording and touring, but I think the band, management, close confidants (Ronson/Rodgers, and perhaps Mr. Hudson), and Warner mapped out an a long-term exit plan a few years ago and they are in the middle of that process. First of all, I love the Paper Gods album. I think “Pressure Off” was the best single since “Come Undone”. “Planet Roaring” is one of my favorite Duran tracks of all time. I think the entire band put EVERYTHING into the making of this album. They did their research, started writing, consulted Nile Rodgers and Mark Ronson, and returned to the studio to complete the recording while bringing in Mr. Hudson to add some current and fresh perspective, which has been a long-standing trait of every Duran Duran record. Fan reaction has been mixed. The band has stated that everyone loves the album, new fans are coming on board etc., but I have a hard time believing these statements. It is not their best work, but it is not their worst either. Overall, I think the Paper Gods album is a success, both on the charts and from an artistic viewpoint, given where the band is in this screwed up age in the music industry. However, I don’t think the band wants to go through this cycle again without much to show for it in terms of physical units sold, or chart success (outside of the initial debut of the album on charts which basically lasted one week). Simon stating that “Pressure Off” was their most successful single in two decades is pure management spin. It didn’t make a dent on significant sales or radio airplay charts. In contrast, even “Leave A Light On” charted on radio playlists in the U.S. 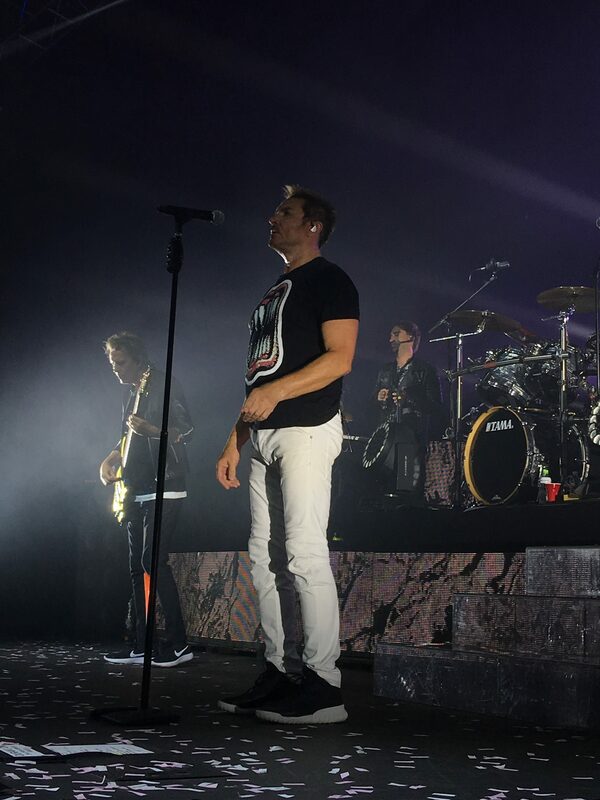 The Paper Gods tour has been a huge success to date. 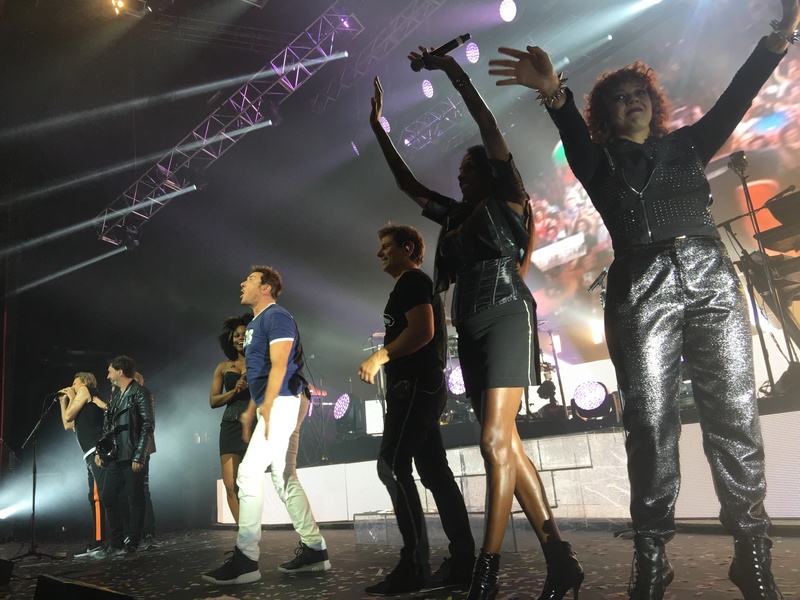 The strategy that was implemented to tour Paper Gods had been brilliant up until July 2016. 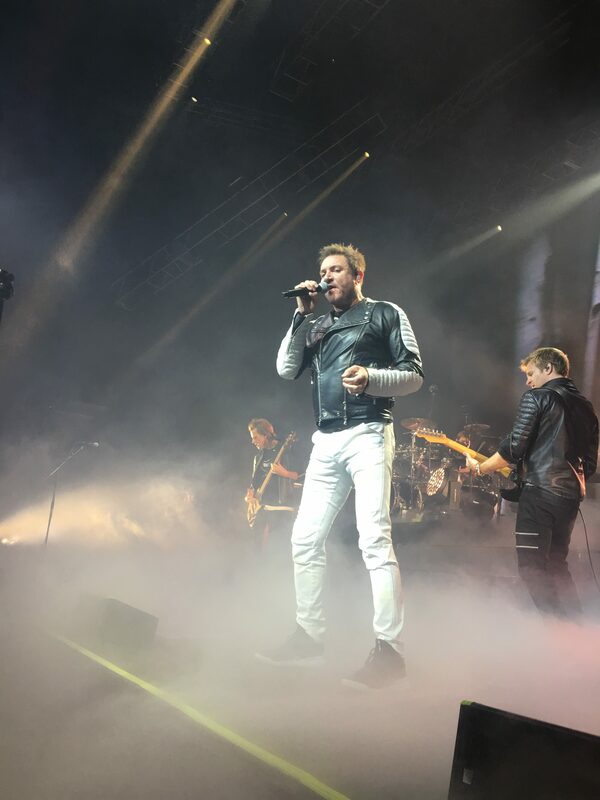 The band, management, record label, and promoters put together a billing that was amazing considering that Duran Duran has not been a full size arena/stadium level touring band since perhaps the reunion and Astronaut era in 2003-2006. Having Nile Rodgers and Chic on tour made sense, and the billing produced some fantastic shows and crowds. Most shows I saw ranged between 7,000 to 15,000 people. Extraordinary support for a legacy band, in my opinion. A pivotal turning point came in July 2016 when it was announced that Nick Rhodes would be leaving the tour for a short period. There has been nonstop speculation as to the reasons for Nick’s leave of absence, and nothing has been released or leaked relating to his situation. First and foremost, I hope Nick (and/or his family) are physically and mentally well. I prefer to focus on the collective unit/band Duran Duran, but Nick is truly the cornerstone and visionary of Duran Duran, and always has been. Nick and Simon have been the two constants over the past 36 years. I cannot imagine Duran Duran existing without either of these two individuals. I don’t know if there is strife in the band. I thought maybe there was when I was doing some research on this, but I listened to a few interviews, read some articles, and I honestly think things are fine between the band members. However, Nick’s absence has certainly had a ripple effect in the fan community. I don’t think Nick enjoys touring as much as Simon and John. I think Roger still enjoys both recording and touring. Here are some observations I have collected (in one place) that have bothered me over the past 14 months (and years in some instances). These are things that just seem “out of place” compared to previous album and tour cycles. I originally planned to speak on each one of these points at great length…Perhaps this community can discuss these points in greater detail. Obviously some of these thoughts are not my own, but have come from threads posted on message boards, Twitter, Facebook, and other sources. Several fans wondered if the lyrics in the “The Universe Alone” was a goodbye statement. “Planet Roaring” can also be viewed as an exit song, but more on the celebratory side. There could also be some lyrical clues in “Pressure Off”, and perhaps the most debated song on the album “Last Night in the City”. The symbols are obviously self-referencing, but why on a new album of new, modern music? I think the band said it was a conglomeration of images that have collectively “gotten us to this point of time”, but it could also certainly be seen as a final package. First of all, as a collector…WTF? We were told we would get a deluxe package. I’m still waiting. I’ve exhausted this avenue several times online. I have two additional comments to make. DJ’s are celebrities these days, both in the clubs and on the charts. They demand huge dollars these days. The unreleased Night Version of “Pressure Off” was probably done in-house (Spike Stent, Josh Blair maybe?). The “Last Night in the City” mixes were done by lessor known DJ’s. I’m sure the band and management is unwilling to invest much into remixes and ultimately additional single releases at this point in their career as the return is probably pretty small these days since people are buying less and less physical releases. There was such a delay in releasing both of these from when the initial single was released, etc. The “Last Night in the City” video was filmed 6 months before it was finally released. Director Nick Egan even commented on a fan’s Facebook page that he was not pleased with the process and the end result. The vinyl industry has had a huge resurgence in the past 2 years. Why hasn’t Duran been participating in this event for 3-4 years now? Again, this probably relates to production costs, ROI (Return On Investment), and effort. We previously received some unreleased music for this day. Now, we get a video performance of something that pretty much existed already. Again, few resources are being spent to deliver a unique remix, live set, etc. I live in the United States. I’ve been very happy that I have seen the band on four legs of tours since the album released (counting the upcoming New Years Eve shows). The band or management has decided to only tour the three largest Duran fan base territories: U.S., U.K, and Italy. Europe was told they would get a tour, but Nick’s situation may have delayed or shelved that tour. There were rumors of a billing with Pet Shop Boys for Australia this fall. There have been mumblings of a tour for South America for 2017. No dates have been released. I listened to John’s Katy Kafe from July…I sincerely feel that he wants to further the Paper Gods tour into next year and different markets. Nick’s situation, or management, may have delayed or shelved these plans as well, since tours are announced several months in advance. Who wouldn’t want to spend New Year’s Eve with Duran Duran? I’m going, but there is no denying it…these are two $$$Payday$$$ shows. Big bucks at a fancy new casino resort. I believe the fans deserve to know if Nick is playing or not. In July, we were told his absence was going to be “short”. This has caused a firestorm within the community. Again, I have no idea what is going on, and I hope he is well, but I think fans deserve at least a heads up on his presence for these über-expensive shows. The 1/1/2017 date doesn’t appear to be selling that well. You can view available tickets on Ticketmaster. There are also several seats available for 12/31/2016. I think both of these are sell outs if Nick’s presence is confirmed. I think fans are very skeptical on these shows at the moment. This has been debated to death. I do think the band could put some more effort into this. The current stage production doesn’t allow for a lot of flexibility. I believe this current setlist was developed with the casual fan in mind. It was a high energy setlist, set to the backbone of their greatest hits. I enjoyed every show that I went to, but would have preferred a few changes here and there. I think the band has settled into this formula to keep the most people happy, again tailored towards the casual fan. She certainly has caused a divide within the fan base. Specifically, some people did not care for her using the “askkaty” moniker on her personal twitter. It finally got changed and it appears to be 100% personal now. I believe this should have happened a lot sooner, and I don’t think Simon needed to interject, but again, there is a divide there. I have no problem with the band wanting to bank some buck. Don’t we all? However, the hard-core fan and collector is not being treated like we deserve, many of those points I highlighted already above. The current management is on a mission to maximize earning potential, and give the casual fan a great night of entertainment. The bundling of the Paper Gods CD with the tickets was an artificial attempt to bloat album sales numbers (it actually reentered the charts in the U.S.) and get the album into the hands of the casual fan. I have an extra ten copies of the standard album, and I’m sure other fans can say the same thing. This bundling practice also increases the concert tickets as I believe that some document has to be filed/exist for these units to count towards album sales and charts. Is he working on anything Duran related? That’s the million dollar question at this point. Are the other band members upset while they are still out on the road? We all know Nick loves art, curating, cataloging, organizing, making lists. Some friends have been wondering if he is working on some anthology type project, something that he probably couldn’t do from the road. Hmmmm. Seems very possible to me. I’m sure he’s doing some work while on break. SOOOOO, where does this leave us? I think Paper Gods is the last album. 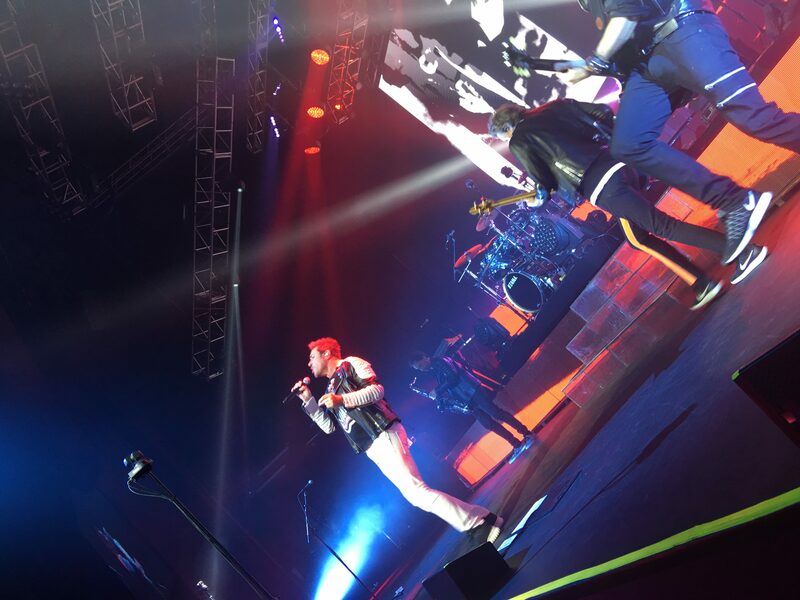 I think that touring Paper Gods will be completed with the Cancun, and New Year’s shows. Heck, they may have already turned in the equipment, video screens, etc. to the lighting and video companies and plan on showing up to these shows with basic equipment from local companies. 2018 will mark the 40th anniversary of the start of the band. I think we will see a large-scale, worldwide greatest hits/farewell tour, and a greatest hits package or anthology type project to commemorate their fabulous career. After that, who knows? Whatever, it seems like a great stopping point to me if I were in the band. I’ll be supporting Duran Duran until I die, whatever happens, I’m in it until the end. It’s time for me to go back to enjoying Duran Duran for the reason I started listening to them in the first place. The music. Cheers y’all, and Duran On! Jeff Bistline has been a dedicated Duranie since 1984. His passions in life are his Duran Duran collection, college basketball, and his boxer dog, Vivi. He is an accountant and lives in Nebraska. I just want to say a very quick but heartfelt thank you to everyone and anyone who has taken the time to write a blog about their concert experience while the band has toured so far. Obviously, Amanda and I can’t be everywhere, but we really want to be able to bring the touring experience to everyone. So, we truly thank everyone who has helped out with that by writing up their own tour experience. We can’t thank you enough – because YOU are what makes Daily Duranie special. 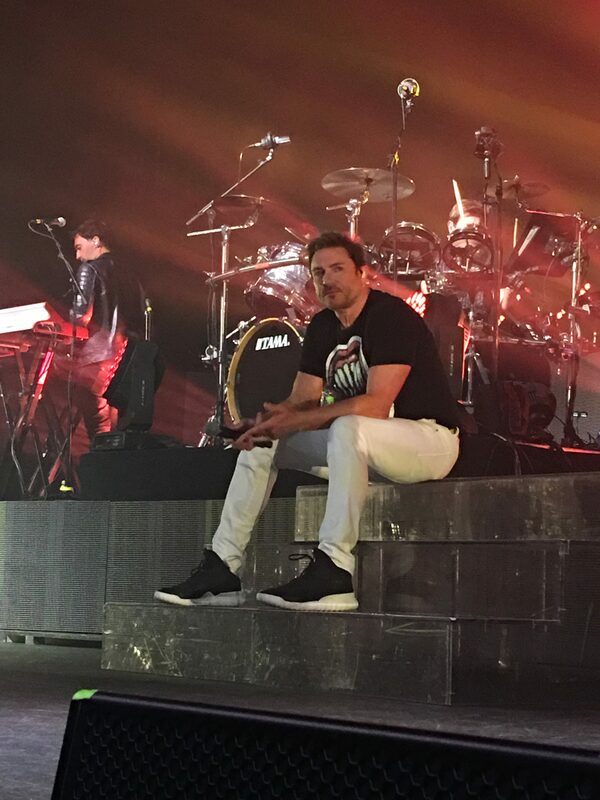 The last two shows for Duran Duran in North America were in Durant, Oklahoma. (Ironic, right? DURANt) Dallas is but just over an hour away from here, so we bought tickets to the Sept. 7 show, but it was changed to Sept. 9 after we bought tickets, so that worked out better since it fell on a Friday night instead of a school night! Grown up girls sleepover time!!! The town of Durant is a quaint little country town with a large casino/resort/entertainment complex. We checked in early that Friday for a day of relaxing, fun and dinner before the 8:00 show (no opening act). This particular weekend was gold for any fan that wanted a run-in with the band or crew members since they all stayed on premises for the entire weekend. The resort was big yet small enough for multiple run-ins with everyone since we all had the same set of elevators if you stayed in the grand towers or suites. There were Duran Duran folks poolside, outside, inside, and at the restaurants. The last blog I did for Daily Duranie was about our meet and greet with JT, so this time I will give more details about the actual concert, but I do have to say that this weekend was just as exciting as our last experience, if not more spectacular. I had purchased 12 tickets total (going out with a bang!!). I gifted a pair to a fellow volunteer Wish Granter for the Make A Wish foundation, he’s been such an amazing person and friend who has never seen a DD show. I also invited 7 friends for a sleepover and saved a last pair of tickets on the floor to do a random act of kindness. Before the show started, I walked upstairs toward the back of the venue and found an older couple who sat way in the back and asked them if I could upgrade their seats. They were shocked and so excited, and high fives were exchanged, then 8:10 hit and we got seated for the show. The remaining 8 tickets in my hands were 1st and 2nd row seats scattered into the middle and JT side of the stage, and this way smaller venue made the close seats feel even closer! The American Airlines Center in Dallas holds well over 20,000 while Choctaw in Durant holds a mere 3,000. It made a huge difference, this concert was so intimate but still felt big! The last show in April had Nick Rhodes at the keyboards, and this show has MNDR. I didn’t notice a huge difference, but I did miss Nick’s presence and energy. The sound was still great but there was just a little musical magic that only Nick brings. The rest of the members brought their A game, everyone was all smiles and great energy. On the subject of energy, Simon was very much perfection this night! In April he had some throat and coughing problems, but this night, he was on point. Simon was just happy and fun! His banter was silly, he started the evening with a joke about if we all had ordered Papa Johns pizza for dinner, since there were Papa Johns flyers and advertisements all over the resort. That made us all laugh and his smiles and happy energy took us through the entire show. Simon’s voice was as gorgeous as ever, as was John’s bass slapping, Roger’s amazing drumming and Dom, Simon W. and MNDR’s musical support. I was seated front row right below Dom’s spot. We were only separated from the stage, just two feet away, by a metal barricade. My hands easily touched the stage. We were able to see all their expressions, movements and steps. This close to the performers, I could feel their personal energy and passion for their craft. There was a point when Simon and John were together on a singing part and I don’t know if someone did something silly or a little mistake was made, but we could see the genuine laughter between the two friends. That gave us the warm, touchy feelies. Simon also gave us all the same giggles and overwhelming school girl crush feeling when he introduced Come Undone with his usual naughty banter. Only Simon can say Viagra and Cialis in his British accent and make us all crazy. He whispered an additional naughty remark that had the women in the crowds swooning, and the men laughing. We were in the direction of Simon’s smiling and glances at one point during his singing that brought us back to our teenage crush feelings. Tonight, everyone felt like Simon was serenading them directly. That’s something that a true front-man with so much onstage charisma can only do. JohnTaylor (I still have such a bad habit of always saying his first and last name, he’s not John or Mr. Taylor, it always comes out as JohnTaylor, even when I speak with him, I’m such a dork!) was the bass god that he’s earned the title to. When Simon did his usual introduction of JT, the crowd followed in Simon’s chant of “Play that f-ing bass, John!” so loud, so cheerful and with so much joy and energy! He was more smiley, happy and was as JohnTaylor-y as can be. When JohnTaylor smiles, it always feels like it’s aimed at you, because he has the best smile! I spoke with some male friends after the show and they were even saying they have man-crushes on JT after seeing him at this show. Now that is what you call stage presence if the straight men fall in love with you too. Let’s not forget about our man behind the drum kit. From my spot, I could see Roger plenty, his seat positioning was many times right in our direction. I’m not shy, so I waved a couple of times and was reciprocated with a wink and smiles. His beats were hot, and energy was sweet and great. The last song brought feelings of sadness and happiness. We were so happy to have been in this moment and feeling, yet sad it was over. I did spend most of my time singing, dancing, swooning and taking in all the sights and sounds. They looked happy, refreshed, and all so gorgeous and they sounded great…. I was so thankful to have spent my time watching and listening, knowing it would be the last concert for a while. I’m also glad they added The Reflex to the set list, it was so good! I only wish that had sung The Chauffeur like they did in some other cities, it’s my very favorite song and hearing it live is at the top of my list of wishes. 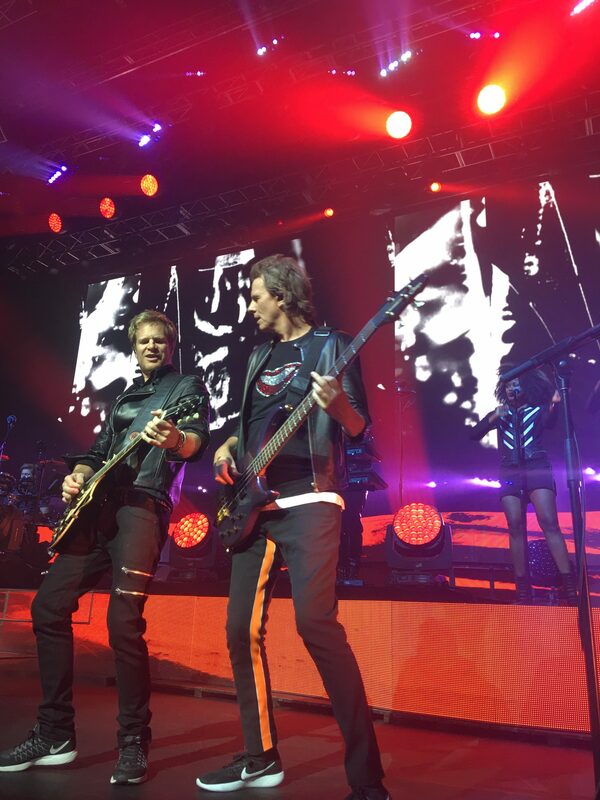 The Wild Boys thanked the crowd for a spectacular tour and great night, bowed and said goodnight…. I waved goodnight to the stage and was also able to grab Roger’s hand as he shook some hands on the way out. The lights came on and it was an aftermath of a ton of confetti and deflated giant beach balls all around to sadly remind us it was over. This show was better for me because I made the choice to pay more attention and take in the concert experience knowing it would be the last show for a while. The fact that the room and stage was much smaller and we were that much closer to the performers made this night just over the top. It was worth the cost of the tickets, even if there wasn’t an opening act. Everyone on stage was incredible and gave this performance their all. John Taylor had told us earlier that day that he really loves performing, loves the feeling of bringing the music and excitement to his fans. He said hopes to do this over and over again and for as long as possible, as this is truly his happy place. I believe that, and he proved it this night on stage. My biggest regret? Well, my biggest and only regret was that I wasn’t smart enough to plan ahead to buy tickets and rooms for both show nights. I bet the last show must have been incredible if the next to the last show was so amazing. Regardless, I am still so thankful for the two shows I have seen this year, both experiences were enough to make teenage me so jealous. 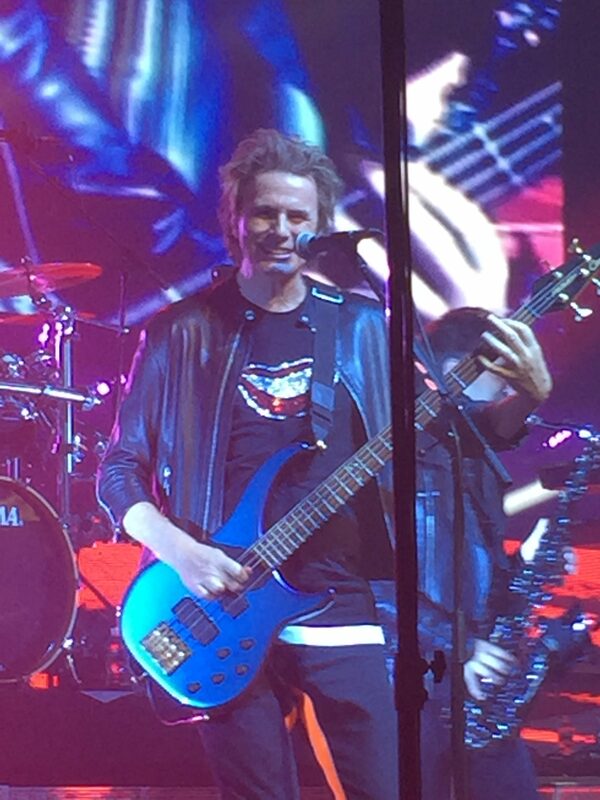 2016 has been some Duran Duran dreams come true. Loan (pronounced “lawn”) McDuffie, has loved Duran Duran since seeing her first video on MTV! Like most people her age, she tries to keep up with the new music but always goes back to 80’s music and anything from Duran Duran. Simon Le Bon was her first crush, but this year after my first concert and meeting them, it’s fair to say she has crushes on them all! 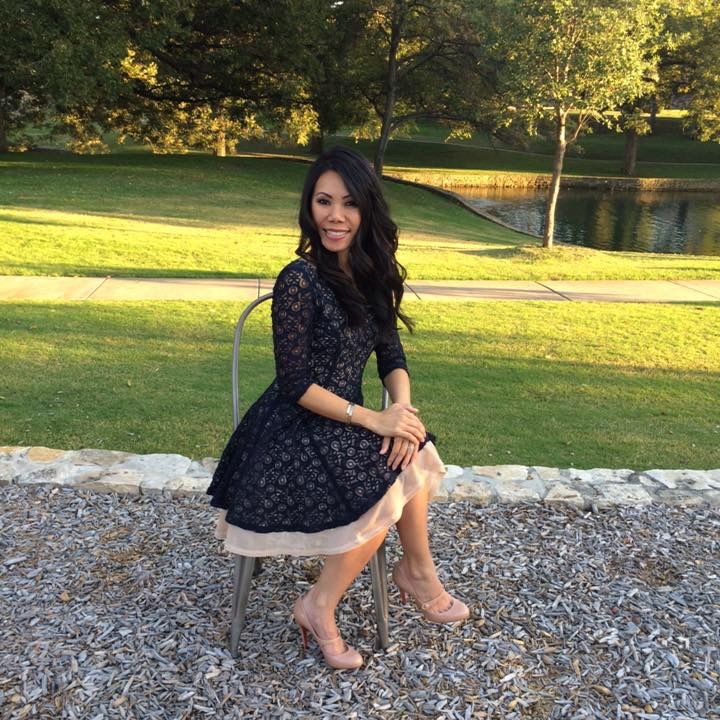 She is a mother, wife, business owner, and volunteer/children’s advocate and fundraiser residing in the Dallas suburbs. I got my ticket for the Duran Duran show in Atlanta as soon as they announced the dates and went on sale. I made the decision to get a ticket by myself in the chance that it would get me a better seat. My other friends made the same decision. We planned to stay at the same hotel, go to and from the show together and have a mini meetup. The day after I got my ticket my best girl that I describe as my “egg” asked me if I would mind if she went with me. I was delighted. I immediately started looking for a ticket close to me but there was nothing right beside me. Still, I was over the moon excited! My best friend wanted to share this with me. I got her a ticket 1 row up from me in the next section. So we would be divided by almost nothing but a little space. This was perfect! I emailed her and we started to get excited. My little group booked our hotel rooms and began the countdown. My mind started to go to giddiness! Duran Duran, and my 2 best friends. I even pictured how our pictures were going to look. My best friend had some family emergencies come up and she was unable to go. I was bummed. I felt crushed but was still going. I worried about the ticket and I worried about the show and worried about our friendship—which should not have been worried about. I started posting about a ticket I had and hoped to find someone to buy it. On the day before the show, one of my girlfriends from high school, Crista, said she wanted to go. She liked the band and thought it would be fun. We planned on her going. Three of us, including my high school friend and another friend (Kelle), made our way to Atlanta to see my friends and, of course, my band! On the way down there, Crista stated that she wasn’t feeling well so she was going to lay down. I was driving and I looked into the rearview mirror to see Crista asleep in the backseat. When we got to the hotel, I did the introductions and saw my other friends. Crista went up to the room to sleep. 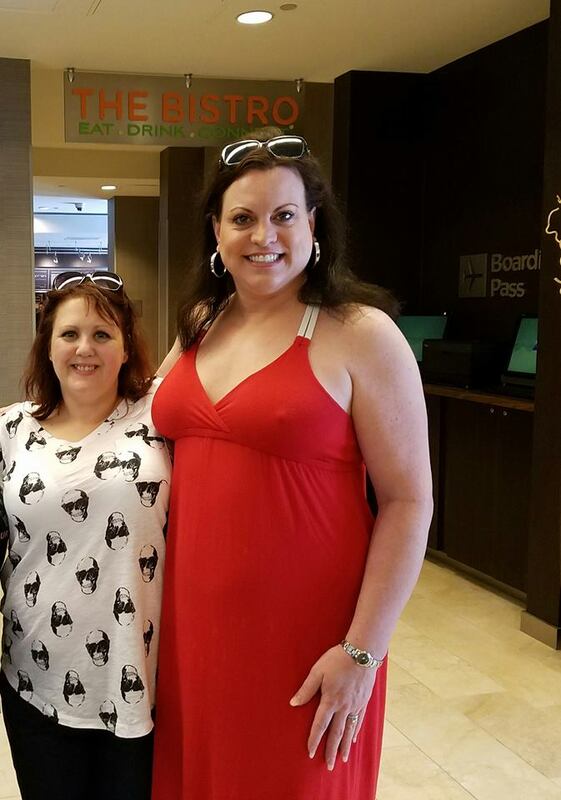 I went out to lunch with the friends I was meeting there in Atlanta. We caught up and were just over the moon happy to be together and to be going to the show. I came back to the room and Crista said she would meet us at the concert because she still wasn’t feeling good. My worry level jumped to high, at this point. I continued to follow the plan to go out for dinner and drinks before heading over to the show. While at dinner, I got a text from Crista stating that she was there and was happy with her seat. We talked about enjoying the show, taking pictures, and being happy, having what we call a “Durantastic” time. This week, almost four months after the Atlanta show, I was out with Crista and other mutual friends. I heard Crista tell our girlfriends about the show. She shared something I didn’t know, which moved me. Something I didn’t mention is that Crista has lupus. She spends a lot of her time in bed in pain. Simple tasks like taking a bath can be tough and there are times where she doesn’t leave her house or bed for days or weeks at a time. She talked about Nile Rodgers and Chic onstage. She said the minute they went on, everyone at the Atlanta show was on their feet. Everyone was dancing. Everyone around her: young, old, big, small was dancing, laughing and acting like they were all friends. She shared that in the midst of all the dancing and enjoying the music Nile shared his cancer story or as I call it his testimony. He talked about how the doctor told him that he didn’t have long but he lived life and beat his cancer. Crista recalled this story this past week and shared how this made her want to live and enjoy life, which made my heart full. One best friend couldn’t go, which gave another best friend a chance to hear the words she needed to hear to live her life and try to enjoy the little moments. Of course, she then went on to tell me how good Duran Duran was live and how all the band members were good looking (DUH!!!!). I gave her a copy of the Paper Gods CD and she said her favorite song is Face for Today. That song is so her! Every time I hear it I think of her. Every time I look at a picture from Atlanta I think of her. She wasn’t in a lot of the pictures because of her illness but she is in the memories of my heart and that show. She made friends with the girls there and this has expanded my little area of Duranies in Tennessee. 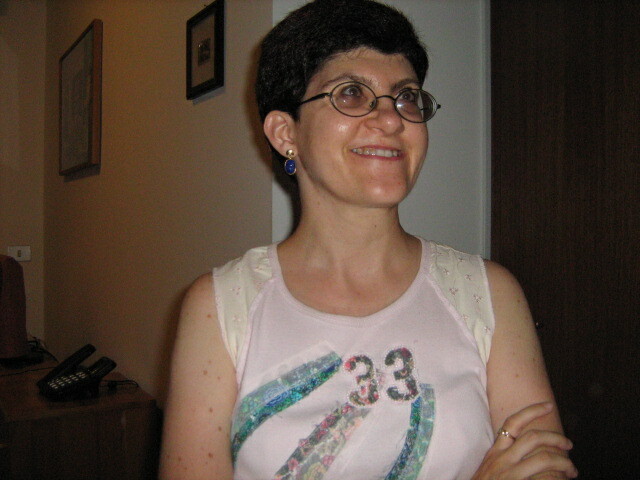 Kim has been a DD fan for as long as she can remember after the video for Hungry Like the Wolf really hooked her. Kim’s favorite songs are Seventh Stranger and Pretty Ones, but her moods change and she finds herself being pulled toward different songs based on her mood. Kim is also a John girl and always has been. She was relatively new to the Duran concert and meet up scene at the end of the All You Need Is Now Tour but found herself at a number of shows and meet ups with a great group of friends since then! She lives in Tennessee with her husband and pets. I am a long-time music fan. I have encountered, and I had the chance to become friend with many others so far. For fun or as a game, I am going to narrow down a list of the fan categories and describe the people I’ve met along the way. In the end, I will also tell you where I believe I fit in. They are usually longtime fans and they are what the music stars call the “fan base”. They are particularly loyal and supportive. Sometimes, their support and points of view are so strong that it’s hard to have a dialogue with them on any different view of the topics you are speaking of. These fans have a strong “ego”, which sometimes makes them seem as sort of “Guardians of the Flame” of everyone’s passion and which is sometimes not necessary! You can be sure that if any other music fan tries to bother you, these fans immediately come to your help and defend you from those “bullies”. The hard-die fans are usually awesome administrators of Pages, Groups, Fans Communities, so on… on the social sites. 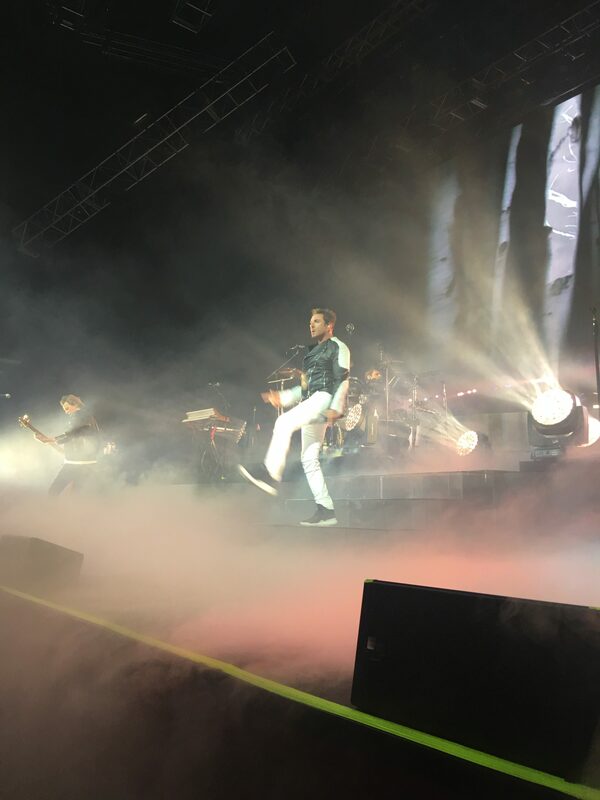 They are usually a type of conduit between the music stars and the fans, even if they themselves do not know the band personally or work for the management. 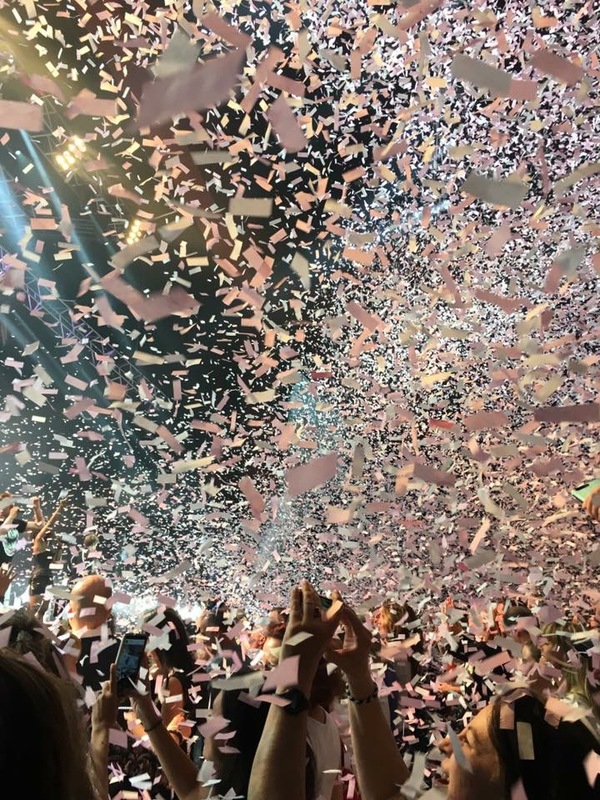 They are also hard-die fans, but the difference with the above category of fans is that they can come at any point during their music heroes’ career. They are lovely, mostly open-minded people. They love whatever their fave music star releases. The beauty of being with them is that you can chat with them, unless you hurt them or you are rude. The key term of their fandom is “freedom”: they want to be free to love, free to say their opinions, they want to be free to pick up the friends they need and they want to feel free to even criticize fans and heroes when necessary! The fans who participate in this group seem to be relatively young because you can see them mostly on the internet. These fans have like a regular schedule they follow, in order to post on message boards, FB, Twitter accounts, so on, only on certain days during the week, or only during a certain time during the days… You can have a chat, you can be their friend, but your conversation can happen only during the regulars’ schedule. They are not rude people, as they don’t want to avoid being with the rest of the fandom: it’s just not possible to them to always be on the computer all day. Their schedule is given by family reasons, by their job reasons, by technical reasons,… They can belong to any of the other fans’ groups I mentioned here and they do love their music star. The celebrities appreciate their posts, and they are grateful for their presence. Other parts of the fandom might get irritated to see them posting, and a few fans might even see them as “stalkers”. They are amazing fans, but you can meet them on few occasions: it depends on the quality of the new release. Nothing can guarantee you that they become hard-die fans, because basically they love only one thing at that moment. Nothing can guarantee you that you can have together a conversation on many topics regarding your fave stars, as they are one-time music lovers. Who do I think I am? I think I am a (lovely) loyal and regular fan. I am a regular for family and job reasons: I can “appear” only because my private schedule allows me to. I am aware it is a bit frustrating for others who care to interact with me online, but for now, it is the best I can do. I was blocked by fans on Twitter, I guess because I expressed too much love and that is bad. I was followed for some tim by more than one idols of mine and that was very kind of them. Do you have other “social” categories” you’d love to add to my list?